Description: With a thunderous roar, a Werelupe came out of a doorway up ahead. Description: Jeran held Lisha so tightly she could hardly breathe as he scolded, "Lisha! What possessed you to do such an insane..."
Description: "These directions, coupled with my own notes and translations, will lead you to the underground chamber where the 'Son of the Sun' hid his greatest treasure." Description: He'd lived too long, travelled too far, and made too much of a life elsewhere to let himself die back in Qasala. He had to survive this. Description: Alaric eased himself down to the bottom of a long, slick wall with only scant handholds, then looked up at the dot of light at the top of the slope and lit his own torch. "The rest of you can come down now!" Description: Alaric awoke with a ferocious headache – he put a hand to his head as he opened his eyes. Description: "The tiles on the floor are traps – there's one real path to each place, but other than that they open up into spike pits." Description: "It doesn't matter – what matters is getting that Fyora-forsaken Orb out of this palace before your father finds out that it's gone!" Description: Had it really been twenty years since the curse had ended? The Old Qasalan runes written on banners at every street corner proclaimed it, but Jazan still had trouble believing it. Description: "How? She's been a statue for fourteen years! How in Neopia could she have gotten loose?" Description: Hanso said with fake cheer, "King Jazan actually agrees with me? I feel so loved!" Description: "I am the Games Master! Please leave, unless you wish me to utterly defeat you." Description: Hanso muttered to Jazan, "Congratulations. I think we've managed to find someone who's even more annoying than I am!" Description: If it had been any other night, Jazan would have been excited. The Vault of Queens contained some of the most powerful artifacts that had ever existed in Neopia, but mere mortals were rarely allowed inside. Description: The next morning, Jazan and Altador leaned over a large map of Faerieland and the surrounding land in Fyora's main library as Hanso consulted the golem book. Description: Brynn asked, "Are you sure you can lead us to Xandra, King Jazan?" Description: Jazan wasn't swayed for a second by Xandra's talk of power and conquest. He'd heard words like that before – that was the way Razul had talked. Description: "If I wanted that blaster fixed with Mallard tape, I'd have done it myself!" Description: "I'm glad we found you. This isn't a standard shipping lane – Spaceward 6 is here to patrol for pirates. Has your ship been attacked?" Description: Cassius slid into his seat as Marzai began, "The sorceress Jalitha has been a problem for Eoxan-zortha for centuries..."
Description: Trinian shouted, "Any sign of the shadows?" 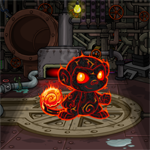 Description: As the flame subsided, a little Grundo wandered up. "May Mira bless our meeting, my friends! I'm glad that you've finally arrived!" Description: A portly Tonu snorted. "Surely you jest, Lord Firetamer." Description: It wasn't as if he had the same skills – the useful skills – that everyone else had, anyway. Unless Jalitha needed some pipes fixed, he was pretty much useless. Description: It was all too clear that the mine's tunnels had been abandoned for lifetimes – there were drippings and scuttlings in the darkness beyond the range of their iridan lamp. Yaxal asked nervously, "Just how stable is the rock?" Description: And then he realized that the darkness seemed a little... blacker... than it should have. Horns rang out from the tops of the towers. "Shadows! Shadows! Shadows attacking!" Description: Cassius said, "We'll save her. And when she sees us she'll start complaining about how we took our own sweet time and how she could have gotten herself out easier." Despite his joking, though, he couldn't get Jory to smile. Description: Then he felt a draft. There was a bigger room up ahead. He was close – he could feel the darkness lurking beyond. Description: Jazan sighed. Nabile loved throwing herself into holidays, and he supposed it would be fun for the children. But he had no fond memories of them, himself – for him, a holiday had been a day when he successfully avoided his father. Razul had certainly never hung a stocking or a sprig of holly in his life. Description: Bokan snapped, "Tomos, are you paying attention?" Description: "Tomos upset an Ummagine cart to let him get away, but couldn't get away fast enough himself. He's cooling his heels in the dungeons right now." Description: It was people like Jazan and Amira who were royalty to the bone, not her. But the guard was holding out his key. "Shall we go, then, milady?" Description: And all they had was this useless mirror. He muttered, "You'd think King Jazan could have given her some sort of magic weapon or something useful." Description: Yari asked, eyes wide, "You really turned him into a Scamander?" Description: Tomos was getting irritated quickly. "Once a Scarab, always a Scarab. Don't talk about her like she's some sort of traitor." Description: "The news has gotten out. We'll have allies, and his soldiers and sorcerers won't help him too much if the whole city has turned against him." Description: Nabile slipped her knife onto her belt – the only thing she had left to do was to cover her face and hair with a wrap like the desert traders used, so that no one would recognize her before the fighting began. Description: Amira said, "I want to go to the palace, and the throne room." It was official – Nabile was the only sane royal person that he knew. Description: It still seemed strange to Tomos that he was in charge of the other four Neopians, instead of being marched along in irons behind them. Description: Jaryth hit his head against the table repeatedly. "He convinced the captain to leave without us? How in Nuria's name..."
Description: Tomos looked around the deck of the Sea Queen at the sailors preparing for a battle with pirates, wishing that any second he would wake up and it would have all turned out to be a nightmare. Description: "There's not much we can do until we get to wherever they're sailing to. Then we'll try to free ourselves and get those jewels and the treaty back." Description: "I'm a pirate. I don't need to be dignified." Description: Tomos took several steps back – the Scarabs and the other urchin gangs took care to steer well clear of the Thieves Guild and its enforcers. Description: Tomos had never had a lock pick that was more than a bent bit of wire, and now that he was in a position to actually afford real ones he had no need for them. Description: Kipras blurted, "Behind the throne! Door! Caves – they lead to the sea! He's got his treasure down there, and a boat to escape in..."
Description: Scarblade only laughed – a cold, harsh noise without a trace of joy. "You're in an interesting position to be making demands, Captain Tomos." Description: As soon as the Lutari had left, Esmeralda burst out laughing. "He's crazy!" Description: Nabile asked, "Has something gone wrong, milady?" Description: Mirzah grumbled, "What do they put in Faerieland's water that makes them think it's such a good idea to do things at dawn?" Description: Jazan threw his magic out in a brute wave – no finesse, just power – in order to try and keep himself from being swamped and buried in the merciless tide of sand. Description: Only Jazan's weariness would keep him from having a wakeful night. He stared up at the stony ceiling, wondering what it would take to defeat an ancient king thoughtlessly released into the world. Description: Jazan found that his fists were tightly clenched. Why couldn't the evil kings of Qasala stay dead? Description: Sambar bellowed, "Press through! They're a distraction! We've got to get to the guards at the palace!" Description: Jazan stared at Nightsteed. "What's Lord Asyir been arrested for?" Description: Kiri said, her voice small, "Could you win if you fought him?" Description: She sniffed. "How can it be that we did everything right, and it still went wrong?" Description: Asyir and Seji would be ready to deal with anyone who broke through, or fight if it all went wrong. Jazan, with both sword and magic, had to be prepared to fight the Werhond. Description: Katrina asked, not liking the cold feeling at the pit of her stomach, "What in Neopia would scare a Meepit?" Description: Marlos thought as he crouched in a shadowy alley not too far from the palace. He wanted nothing more than to go home, get in bed, pull his covers over his head, and make this all go away. In order to have the best possible Moltaran experience ever, you need to dress the part!